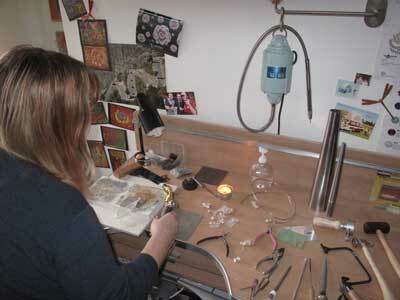 My name is Jill Bell and I am a Jewellery Designer and Silversmith working in a workshop in London. I have been a designer for over 30 years indulging my creative interests. I originally trained in fabric design and embroidery, creating many exciting and innovative pieces. From large textiles by machine and hand, to bags, beaded purses and jewellery. The love of jewellery led me to retrain in silversmithing. The design element of embroidery jewellery became one of my main interests, which gradually developed into a love of silver and gold jewellery design. In 1998 I attended a local college for silversmithing, allowing me to learn many different skills and create a range of different pieces. With family commitments I had to leave the collage for a few years; not giving up I set up my own workshop and taught myself at home. For the last few years I have started attending a London collage allowing me to continue learning, share my knowledge, and entertain my interest.